In a small galley kitchen with limited counter space, we needed a magnetic knife holder, but we had a hard time figuring out a safe place to put it. With these deep window sills, the knife holder couldn’t hang horizontally which is how it’s intended, There was no reason why we couldn’t turn it vertical and have the handles at easy reach above the cutting board. 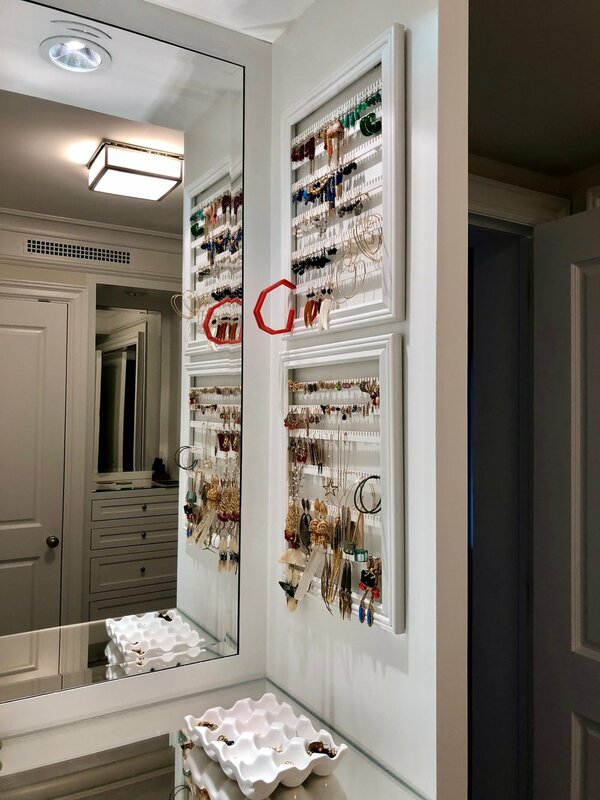 Storing jewelry is always a challenge. Digging around in these little trays isn’t easy to deal with on a daily basis. I love these earring “frames” as they can fit in almost any space and make it easy to see what you are looking for. At least one of these Door & Wall racks end up in any home I visit. It’s a perfect solution for a coat closet keeping hats, scarves, gloves and umbrellas within easy reach. Keep ladders and step stools off the ground as in this case, it allowed for recycling bins to live underneath them. With different hooks I incorporate these tracks in utility spaces to keeps mops and brooms in their place. I love this low profile coat rack. It’s a great place for your guests to hang their coats if you are short on closet space. When not in use, it folds flat against the wall. This lovely shallow cabinet stores an abundance of toiletries without taking up any valuable space. What are your favorite vertical solutions? Please share in the comments!